Avenue Mac-Mahon. 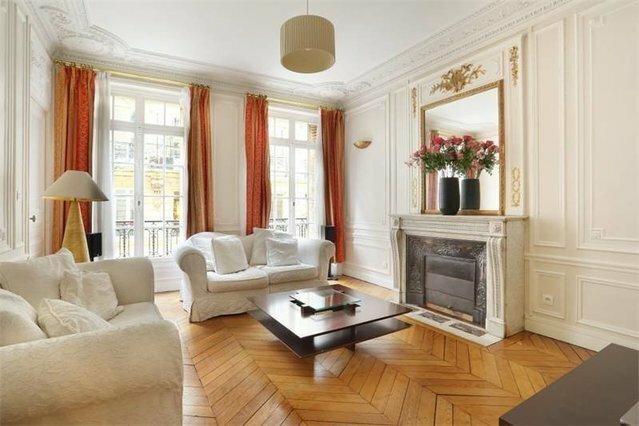 This apartment boasting period features is on the first floor of a fine freestone Haussmannian building in a prime location between avenue des Ternes and the Arc de Triomphe. Offering 100 sqm of living space, it includes an entrance hall, a west-facing living/reception room featuring Herringbone parquet flooring and a fireplace overlooking a peaceful street, a dining room with an adjacent kitchen, and two bedrooms each with a shower room. The apartment benefits from a star-shaped floor-plan, and it would be possible to create a third bedroom if required. Sold with two cellars and a 15 sqm studio for an extra cost of 150 000 Euros.